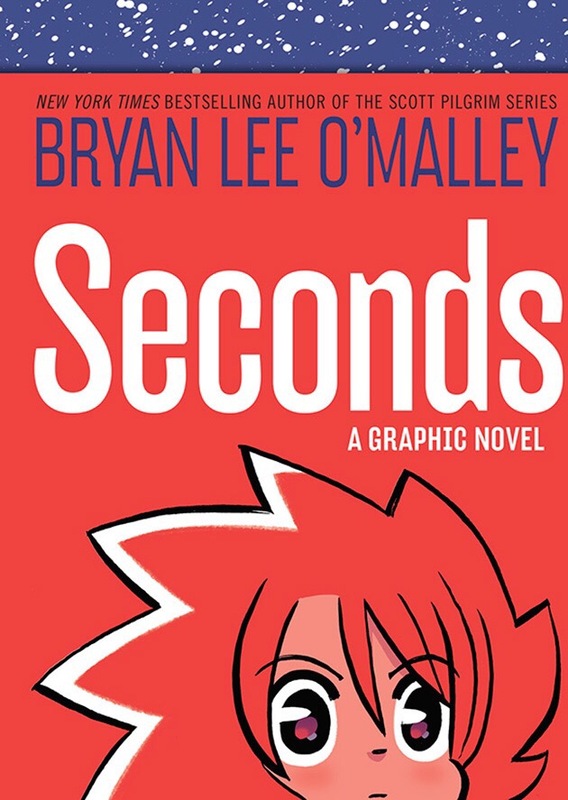 I just finished the graphic novel Seconds by Bryan Lee O’Malley for my Graphic Novel Book Club. Then I found out that O’Malley is the creator of Scott Pilgrim, which I’ve never read but even I, relatively ignorant of the stars of the graphic noveldom, know of Scott Pilgrim and O’Malley’s success with said Pilgrim. So maybe now I’ll read that. I’m kind of glad we didn’t read Pilgrim because there would have been too much expectation. But I took Seconds at face value on its own and really enjoyed it. The title Seconds refers to second chances, as in you messed things up, but you get a chance to go back and fix your mistakes. The title also refers to the name of the main character’s restaurant, as in the food is so good you want seconds. Clever, no? And the drawings of the food do look delectable, even when I can’t tell exactly what they are. The story is ostensibly about chef Katie leaving Seconds and starting a new restaurant where she will be chef and own the place. She’s been saving up for this for years, living in a hovel above Seconds, and now the building she bought for the new restaurant is turning into a money pit. Should she have picked a different location, one in better shape that she wasn’t so passionate about but would have been less risky? All she can do now is wait, and so she’s hanging around Seconds when there’s an accident and a server gets injured, basically because of Katie’s disruptive presence. Enter the second chance, involving a house spirit and some magic mushrooms. When Katie wakes up the next morning, she relives the moments before the accident and makes a different choice so that it doesn’t happen. That’s “Revision #1.” As you might expect, something else happens that she wants to fix, and she starts to get greedy, fixing so many things so many times that she can hardly keep track of what version of her life she’s living. She even argues with the narrator at times, revising her version of events as well. I love the exploration of this idea of being able to go back and make a different choice, something we’ve probably all wanted the power to do at least once in our lives. Of course, there are consequences, and O’Malley has fun creating an abstract visual representation of the universe being out of balance. I’m pleased to say Seconds passes the Bechdel test: There is an ex-boyfriend and a couple of love interests, but the female characters are interesting and have intelligent conversations that have nothing to do with men! Plus, they don’t have Barbie bodies. They actually have individual shapes. I really enjoyed the drawing style as well as the story. O’Malley gives us a map of Seconds, showing everything from the prep kitchen to someone messing with their cel phone while sitting on the toilet in the bathroom. I love maps. He also has a great variety of page layouts, some with only a few panels, and some with as many as fifteen when there’s lots going on, but they’re never confusing. It’s easy to follow the flow of the panels. I suspect O’Malley is an expert storyteller, making it look easy, and that the more I read graphic novels, the more I will go back to O’Malley to see exactly what he does to make it so good.